Looking for yummy basketball party food or basketball party favors to send home with your guests after the game is over? 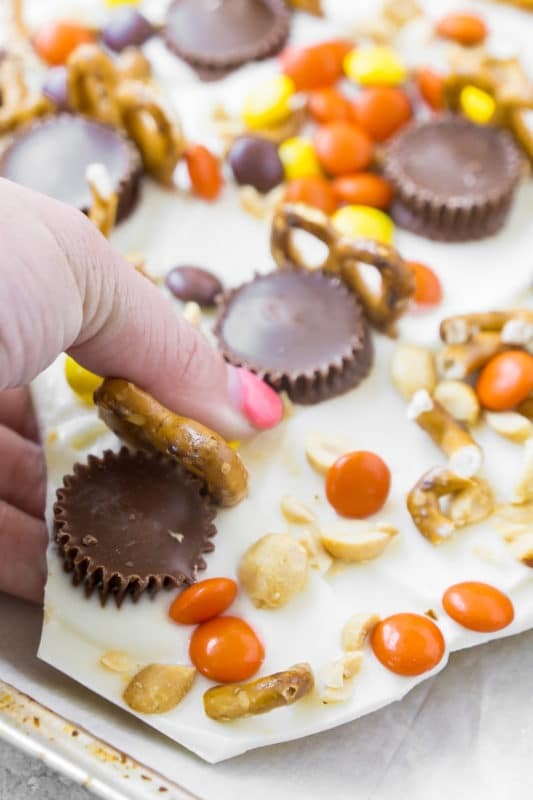 This Reese’s basketball bark is the perfect basketball party snack to enjoy during the game and even better when sent home with guests as cute basketball party favors! 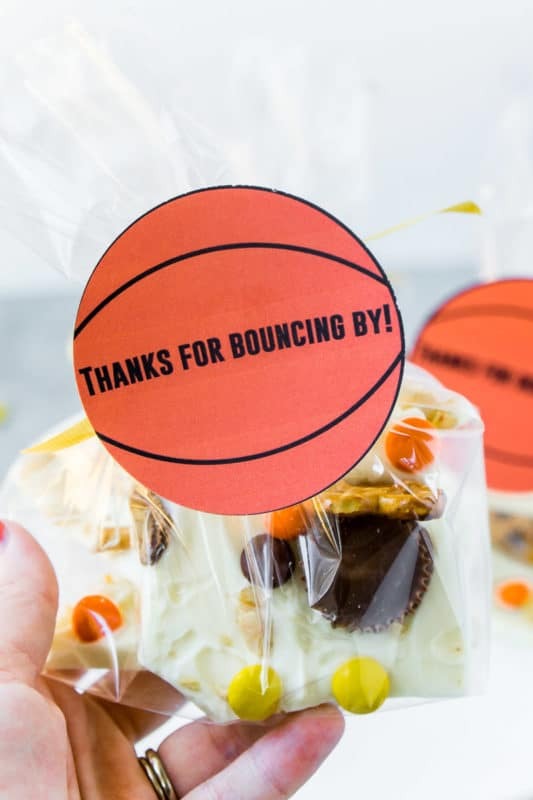 And with just a few ingredients and free printable gift tags for the favors, these basketball treats are a guaranteed winner! While this post is sponsored by Kroger, all ideas and opinions are 100% honest and my own. My family is a big basketball family. They love all other sports but basketball is definitely their main jam. I grew up both watching and playing basketball and this past winter we put our 5-year-old in basketball for the first time. Might’ve been one of the happiest moments of motherhood watching him run up and down the court having no idea what was going on. At least for the first half of the season – by the end he at least understood the difference between offense and defense. I only wish the season was longer. March is one of the best months of the year for basketball fans and non-basketball fans. So much fun watching and cheering for underdogs to make their way through the tournament. It’s one of those sports where as long as you make the tournament, you’ve got a shot. Know what makes the tournament even better? Watching it with friends and family! 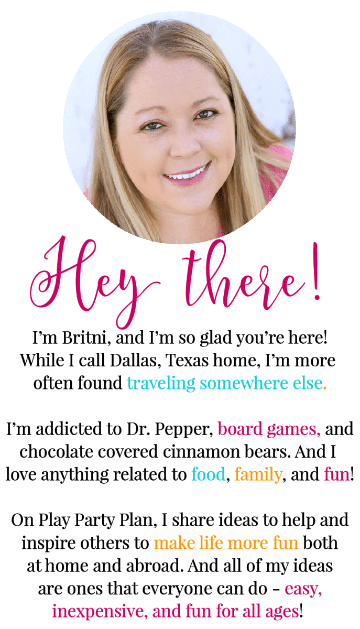 March is also the perfect time to host a basketball themed party, and I’ve put together a yummy basketball themed recipe and cute basketball party favors for you to make watching hours of games even more fun! So grab this printable bracket backdrop from my friend Lindi, create this DIY tabletop basketball court, make Reese’s basketball bark using the recipe below, and pack up a few for friends to take home. It’s all you really need when you have exciting games to watch. I’ll be the first to admit that you when you first look at these, they don’t scream basketball. Not like these basketball cream pies do. Food doesn’t have to scream anything to be perfect. So let me explain why I call them basketball bark. First, all of the toppings I used for the bark are my favorite snacks you’d get if you went and watched a basketball game at a stadium. Peanuts. Pretzels. Reese’s Pieces in basketball colors. It’s the perfect combination of sweet and salty. And second, each piece of bark has my version of a little basketball hoop on it made with a pretzel backboard and a Reese’s Peanut Butter Cups Miniatures net. 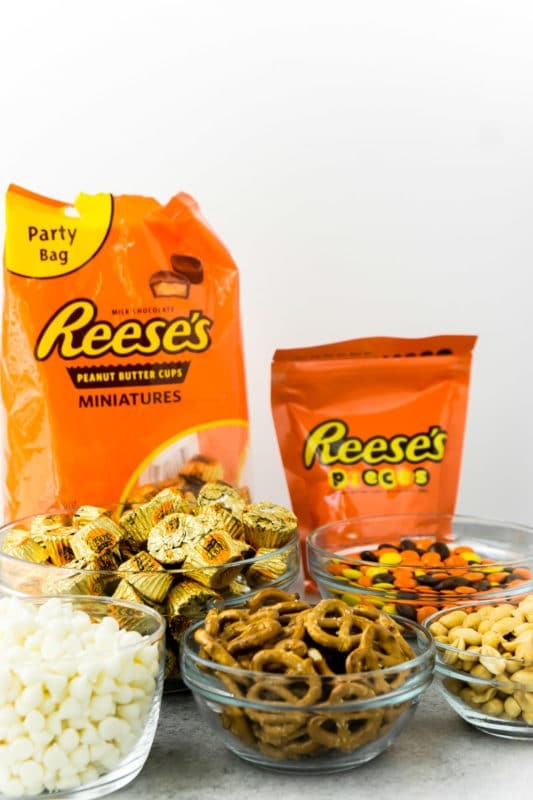 And who doesn’t love the classic combination of peanut butter and chocolate in Reese’s Peanut Butter Cups Miniatures. They go hand in hand just like sports and parties! And lastly, they’re delicious and full of flavor and excitement just like the best game! 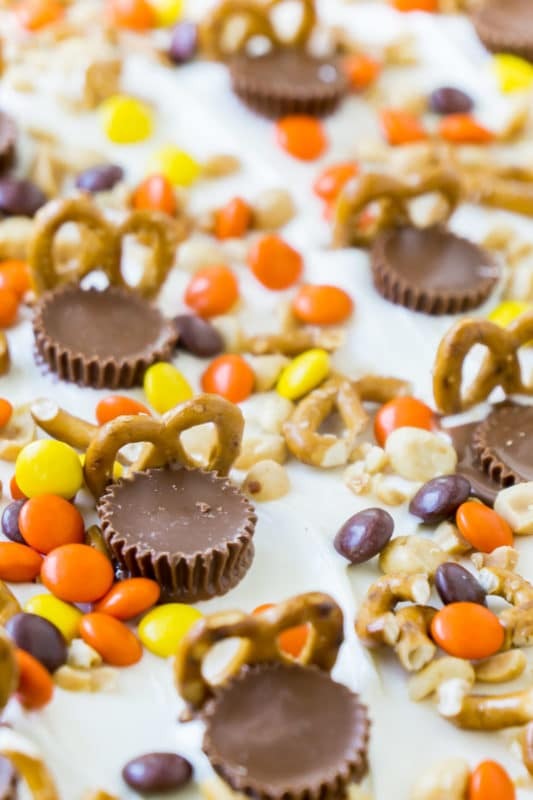 This Reese’s bark recipe is super easy to make and only uses a few ingredients. I picked up everything at our local Kroger along with other snacks for the game – chips, drinks, etc. Kroger is my favorite local place to shop because it really is a one-stop shop for all my party food, supplies, and more. I even picked up a t-shirt for my husband’s favorite team! Make sure to read these instructions all the way through before you start the bark. You don’t want to start melting the chocolate if you’re not 100% ready with the other ingredients. It’s not a do each step as you go kind of recipe, it’s a get everything prepped before you start kind of recipe. 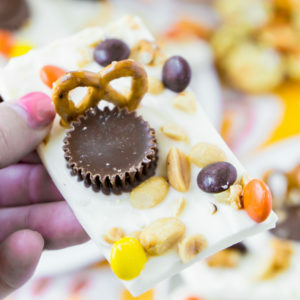 I found that out the hard way the first time I made the recipe – my toppings didn’t stick well because the white chocolate was already beginning to harden by the time I got the Reese’s Peanut Butter Cups Miniatures unwrapped. Oops. 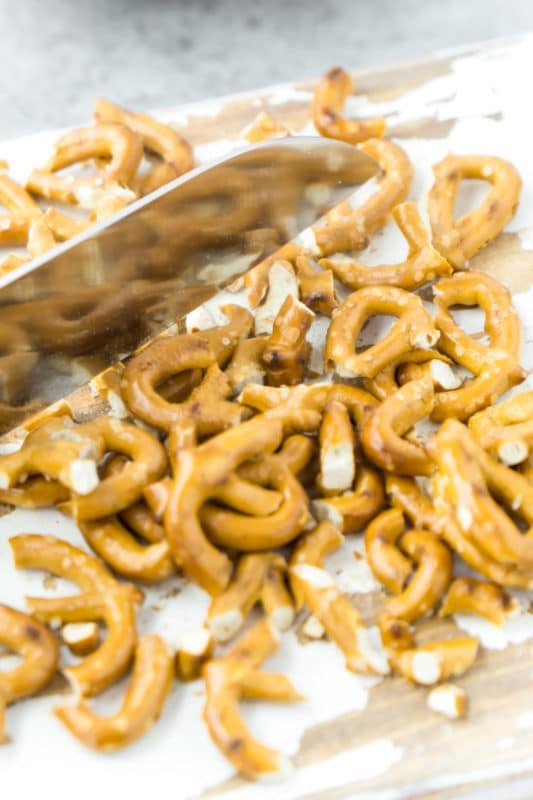 1 – Chop your pretzels into small pieces. You’ll want them pretty small so when you break the bark the pretzels don’t just pop off. Make sure to keep 24 whole ones for the backboard as well! If you really want to you can chop the Reese’s Pieces and peanuts as well but then the pieces won’t look like basketballs! 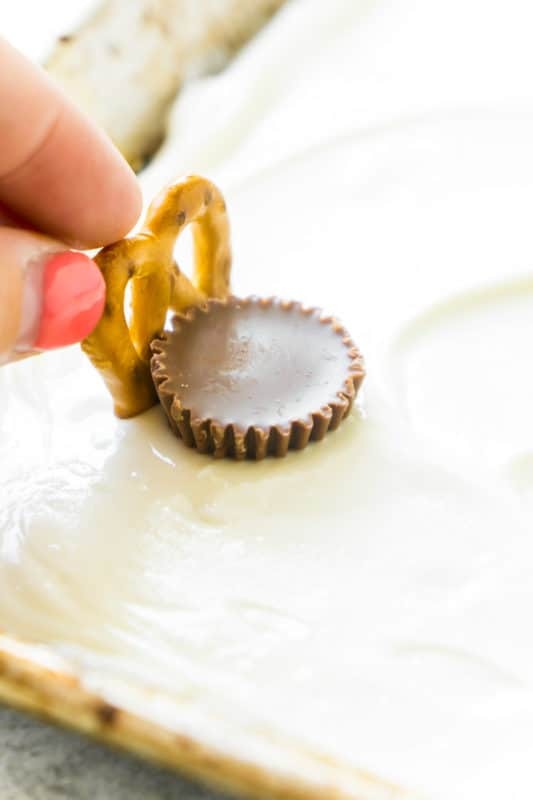 2 – Unwrap all of your Reese’s Peanut Butter Cups Miniatures. If you’re using a regular size baking sheet, you’ll want 24 unwrapped minis for the “hoops.” Any leftovers can be added into a bowl on your party table for snacking! 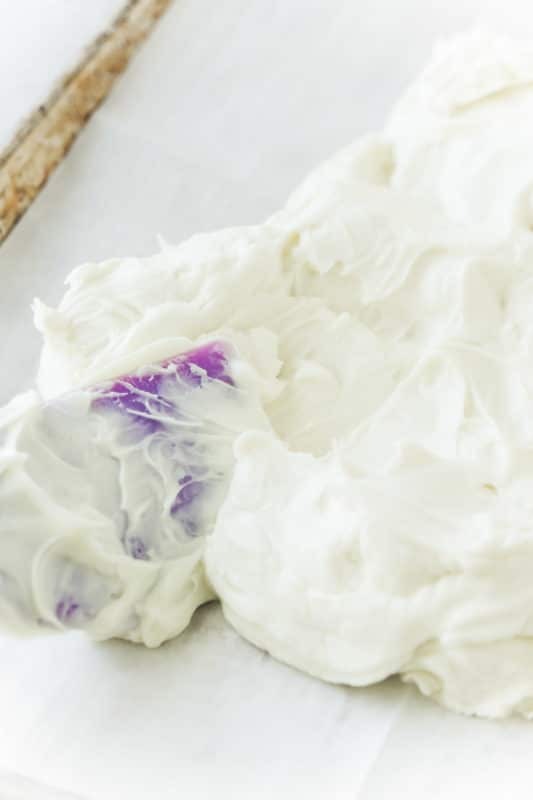 3 – Combine your white chocolate and coconut oil and either melt using a double boiler over the stove OR melt on medium in the microwave. If you’re planning to use the stove, make sure to stir regularly so the bottom doesn’t burn. If you’re using the microwave, microwave for one minute increments and stir in between. 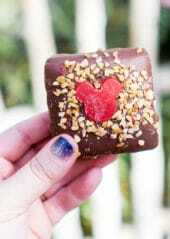 4 – Pour the white chocolate on a parchment covered baking sheet and spread around with a non-stick spatula. This will serve as your bark base. 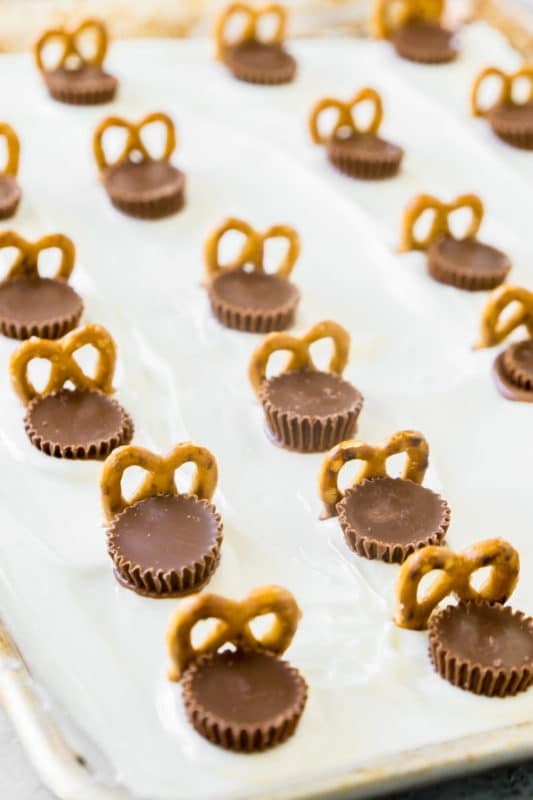 5 – While the white chocolate is still hot, press in 24 Reese’s Peanut Butter Cups Miniatures spread out evenly (I did four rows of six) across the baking sheet, making sure not to push down too hard or the cups will melt. 6 – Add a full pretzel behind the cups to form a backboard. If they won’t stay up, lean them slightly on the cups. They’ll stay once they cool. 7 – Once all of your basketball hoops are added into the bark, sprinkle the peanuts, Reese’s Pieces, and chopped pretzels around the basketball goals. 8 – Place in the fridge to chill for 1 hour. 9 – Once totally chilled, carefully break the bark into pieces using your hand. I recommend putting one hand right behind or beside the “basketball hoop” on the bark when you break it to maintain the hoops. If you just break freeform, you’ll likely end up breaking most of the hoops and then it’s just delicious bark. 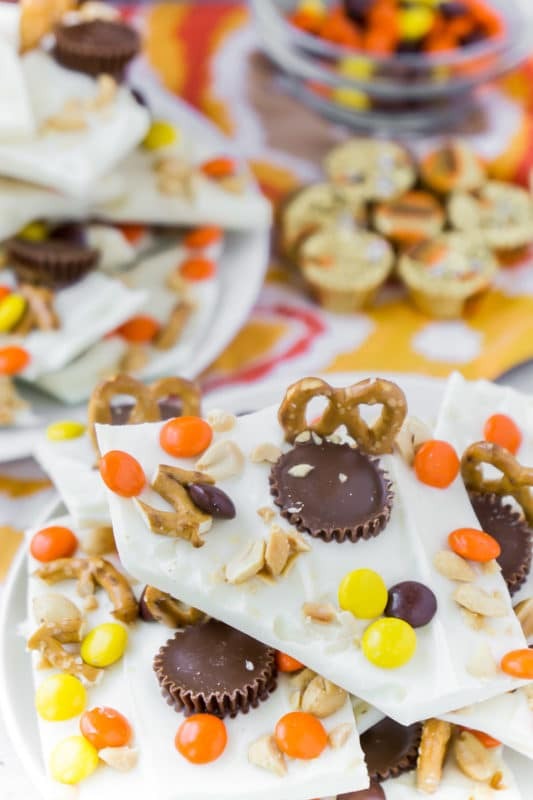 Once the bark is broken into pieces, serve with any other party snacks you picked up at Kroger or any of these game day recipes! If you try this recipe or any of the others from the link above, make sure to share them with friends and family using the hashtag #TasteoftheTournament! 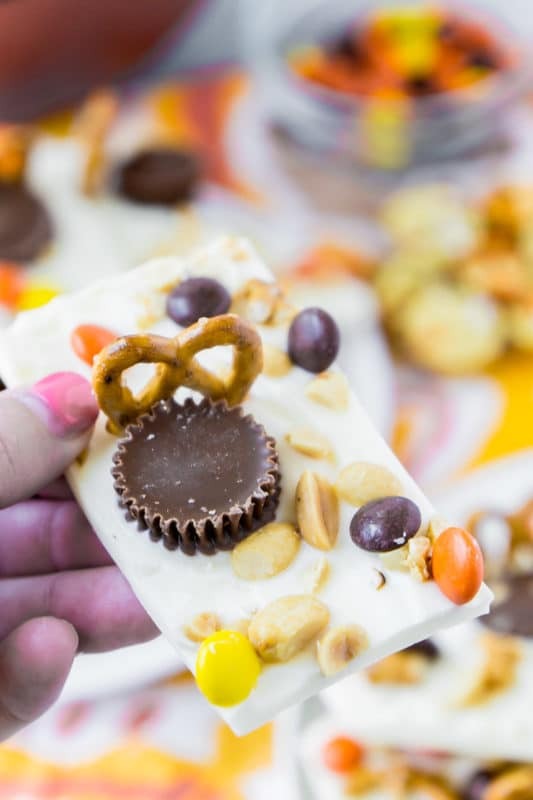 A delicious chocolate and peanut butter bark featuring Reese's Peanut Butter Cups Miniatures and Reese's Pieces. Place a piece of parchment paper on top of a large baking sheet. Combine white chocolate chips and coconut oil. Either melt in the microwave (in 1 minute increments, stirring in between) or on the stove using the double boiler method, stirring regularly. Melt until mixture is pourable. Once chocolate is melted, pour white chocolate on prepared baking sheet. Spread around evenly with non-stick spatula. Place Reese's Peanut Butter Cups Miniatures evenly throughout the chocolate (recommend four by six). 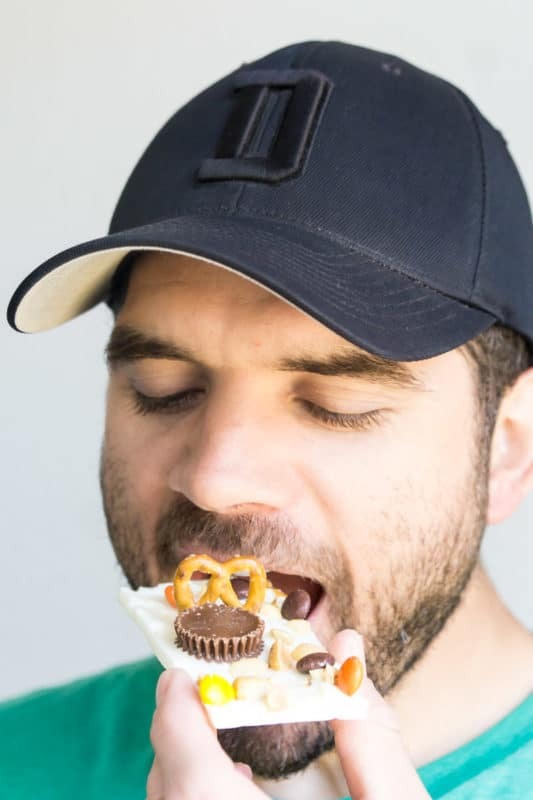 Then place one full pretzel behind each cup. 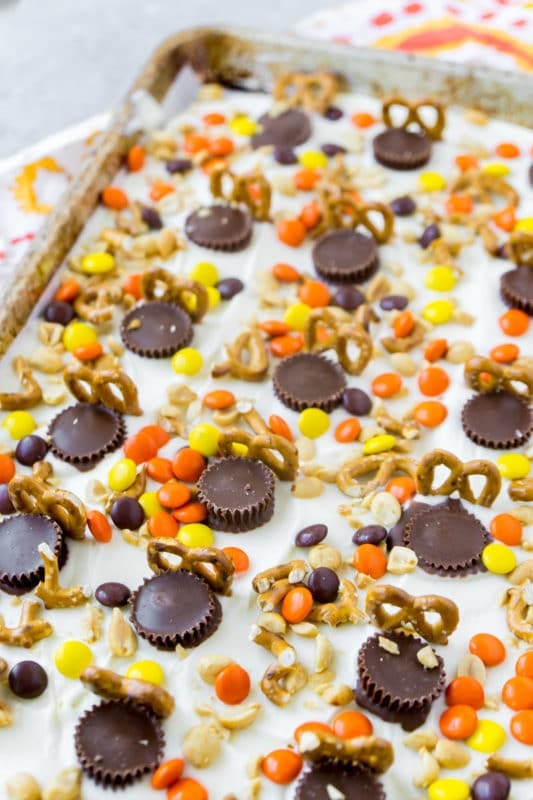 Sprinkle chopped pretzels, peanuts, and Reese's Pieces over top of the bark, avoiding the full peanut butter cups. Place entire baking sheet in the fridge and chill for at least one hour. Once chilled, remove from the fridge and carefully break the bark into large pieces - maintaining the "basketball hoops." 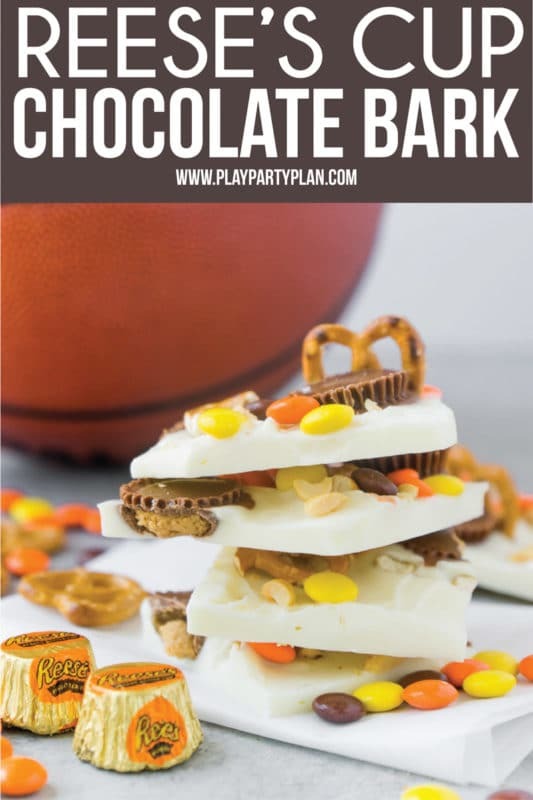 This basketball bark makes great basketball party favors too, especially if someone’s favorite team lost and they need a pick me up on the way home! Simply put a couple of pieces of bark into a treat bag, tie with a little ribbon, and add the free printable tags for the basketball party favors below. I typically like to have my party favors by the door but if you’re worried they’re going to melt, you can keep these basketball party favors in the fridge until people are leaving too. Just don’t forget to hand them out or you’ll end up eating basketball bark for days. On second thought, maybe forget. Or just make a double batch so you can give it away and have it for days too! 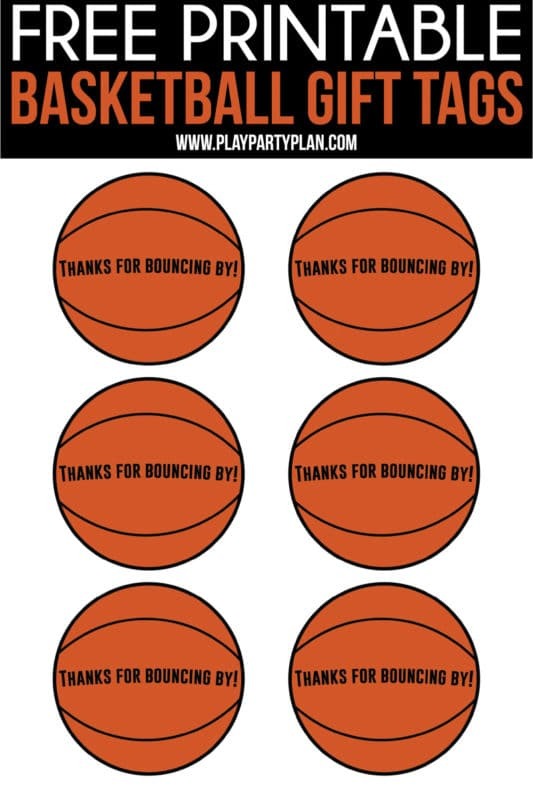 Enter your first name and email address below to download the free printable basketball party favors. You’ll immediately be taken to a PDF file with the printables and be emailed a copy of the PDF for later. If you do not see a form, click here to get to it. The PDF file will come with two pages – one that is a 3″ basketball and one that is a 2 1/2″ basketball. If you’re making more basketball party favors and filling smaller bags with bark, use the smaller tags. If you want to give larger portions, the 3″ tag is perfect. I used the 3″ tag in my photos above. 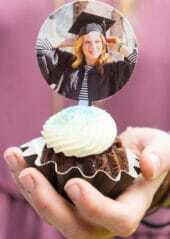 Simply print them out on white card stock and use a 3″ or 2 1/2″ circle hole punch to punch out. 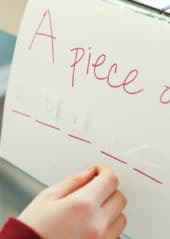 Then you can either add them to the treat bags using double-sided sticky tape or put a small hole using a regular hole punch in the top and thread the ribbon through the holes. 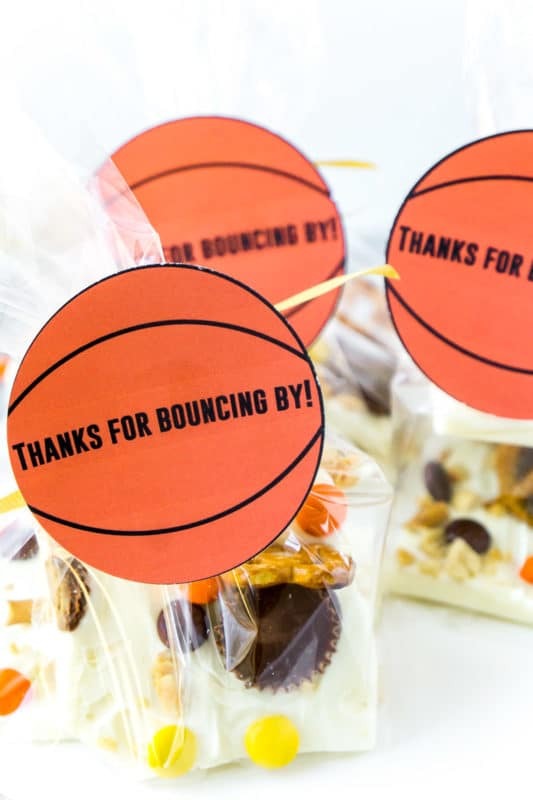 Don’t forget to pin these basketball bark and basketball party favors for later!